If you were thinking that Cannon Cat is just your typical ‘fire the cat between the cannons, dodging penguin-copters, bouncing blowfish, and other obstacles while saving the bubble-imprisoned flying fish from the clutches of an evil emu’ game, well then think again. Okay, if you’ve actually already played a game with this exact plot, I’m speechless. While perhaps not a revolutionary concept gameplay-wise (Big Pixel Studio’s Land-a Panda offers somewhat similar cannon jumping game play) it is easy to see that a lot of thought, enthusiasm and polish went into the making of Cannon Cat. 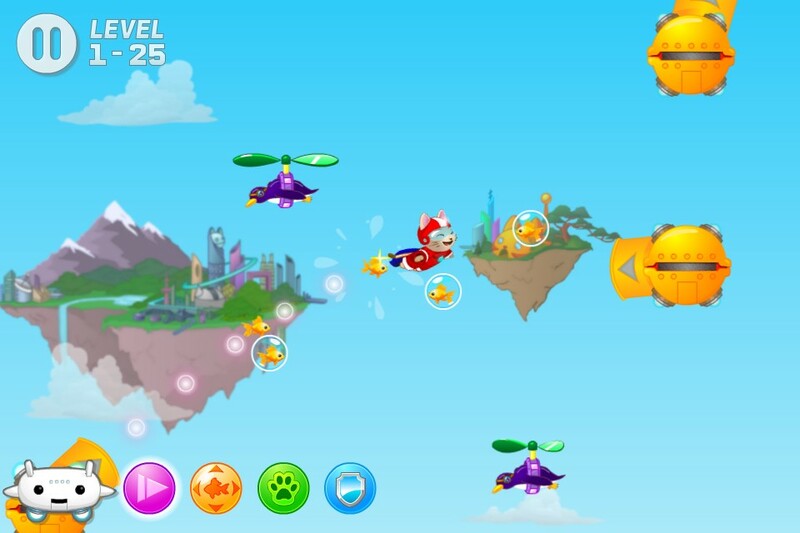 The goal in each of Cannon Cat’s eighty levels is to first and foremost, reach the portal at the end of the level, with a second award given for successfully rescuing all of the flying fish. More than anything, the game is a test of reflexes and patience. Timing your jumps between cannons is crucial, so you’ll need to keep a watchful eye and wait for just the right opening. Rush it and you’ll hear Cannon Cat’s cute (but desperate) meow for help as he plummets off the bottom of the screen. It doesn’t take a rocket scientist to figure out the game’s controls (though the game was created by one). In fact, Cannon Cat’s simple one-touch to jump controls may be fairly elementary, but perfectly suited to the casual nature of the game, making it instantly approachable by all players young and old. However, don’t let this friendly looking feline fool you, for once you reach some of the more devilishly difficult levels you may quickly discover that this cat has FAR MORE than 9 lives as you get knocked out of the sky by yet another penguin-copter or overshoot the goal for the umpteenth time. The guys at Loqheart have done a nice job gradually increasing the difficulty of the levels as you progress through the game. Though I would have liked to have seen a little more variety in the actual level layouts. You begin with cannons that just jump back and forth between two positions, eventually moving onto ones that rotate a full 360 degrees, increasing your opportunities for failure. Like many other games in this genre, you must successfully complete one level to unlock the next. 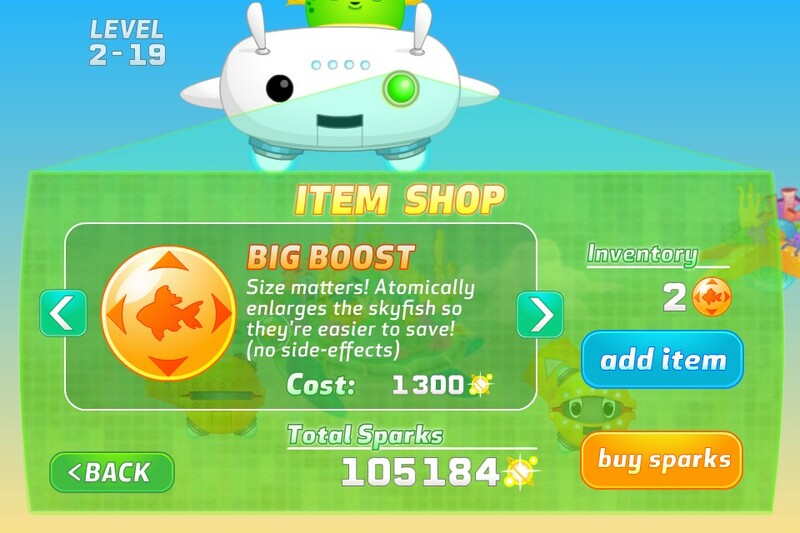 For players who are struggling getting past a particular level or collecting all the fish, you do have four power ups at your disposal (in limited free quantities). These include: ‘Cannon Time’ which slows down the action, ‘Big Boost’ which enlarges the flying fish to make them easier to catch, ‘Auto-Save’ which lets you continue from the last cannon you were at before dying, and ‘Shield’ which protects you from the penguins. Players start the game with two of each power-up and additional inventory can be purchased using the in-game currency known as Sparks, which are fortunately handed out fairly liberally, or can be purchased (for real money) in packs as well. You can also receive a 10,000 Spark bonus just for rating the game in iTunes. Not being a fan of consumable IAPs myself, I purposely tried to get through as many levels as possible without spending a dime on DLC or even relying on my free initial reserve of power-ups. Fortunately Loqheart doesn’t try to nickel-and-dime players with micro-transactions for every little bit of content. Instead they offer these IAPs as a means for assisting stuck players. Without cashing in any of my free feline-enhancing power-ups, I was able to successfully complete 36 out of the 40 levels (including rescuing all of the fish) in the first of the two 40-level destinations. That’s definitely NOT to say that all the levels are easy, in fact as I already mentioned, they can get quite hairy and require very precise timing. Cannon Cat is a much more challenging game than its cutesy graphics may convey. As long as you are willing to put in the effort to try levels multiple times and not look for an easy pass, it truly is a freemium game that can be played without any compulsory in app purchases. Given that fact, I’m willing to (temporarily) overlook the lack of Game Center for achievements and/or global leaderboards. Hopefully these will show up in a future update, along with iCloud syncing so your progress and power-up resources can be shared between devices. Grab your free copy now, you’ll thank me later, well, at least until you are attempting a level for the twentieth time trying for all the fish.